How many times have you heard the argument that rice and noodles can’t be bad for you because those who live in Asian countries eat them as a staple food and they are slim and healthy? Read Kelly Peterson’s story and you will learn that a healthful diet is the same the world around. When Kelly found herself putting on weight, she sought advice from the experts. She was told that eating less and moving more was the key to staying slim and healthy. Although she was one of the few who actually had the determination and will power to stick to a plan of semi-starvation and exhaustive exercise, she had very little success. Convinced that she had to choose between good food and good health, she resorted to eating one small, low-fat meal a day and working out three times a week. This austere regimen left her tired, depressed, constantly hungry, and suffering from hypoglycemia; still she lost only 11 pounds. Food, which had been one of her greatest sources of pleasure, became a source of pain and frustration. Kelly’s memories of childhood and happiness revolved around the foods she shared with her family in her homeland of Singapore. To her, food was love and it was love that would rescue her from a life of deprivation and misery. When she met her future husband, Dr. Dan Peterson, she discovered that rich, indulgent food can be compatible with radiant health of both mind and body. Kelly wanted to share what she had learned by giving her native comfort foods a low-carb make-over. I was hooked the first time I visited her blog, Cooking Inspired by Love, and saw her version of her mother’s Butter Cake that calls for 9 eggs! Kelly and her husband, Dr. Dan Peterson, co-wrote, The Asian Low-Carb Secret. It contains a wealth of information and inspiration for those who want to experience delicious and sumptuous food while enjoying the abundant energy and glowing health that come from this way of eating. Here’s a small sample of what awaits you in this book: Braised Pork Belly, Chocolate Lava Cake, Marcona Butter Prawns, Steamed Egg Custard, Creamy Mayonnaise, and Signature Slow-Roasted Pork Ribs. 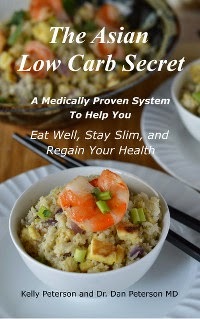 The Asian Low Carb Secret, Kindle edition, is due out on February 6, but you can pre-order it here. The book is also available in Mandarin. I know you’ll love Kelly’s story and her recipes look fabulous! Kelly’s book was dedicated to her father who died of type 2 diabetes. She has offered to donate 50% of the profits from the Kindle version of her e-book to the Nutrition and Metabolism Society to fund our research projects. She chose NMS after researching other groups and finding that none of them advocated low-carb diets for diabetics. Support Truth in Science: If you are not already a member of NMS, please consider joining today! Low Carb Asian Recipes. Bookmark.